"Laser Scorch! 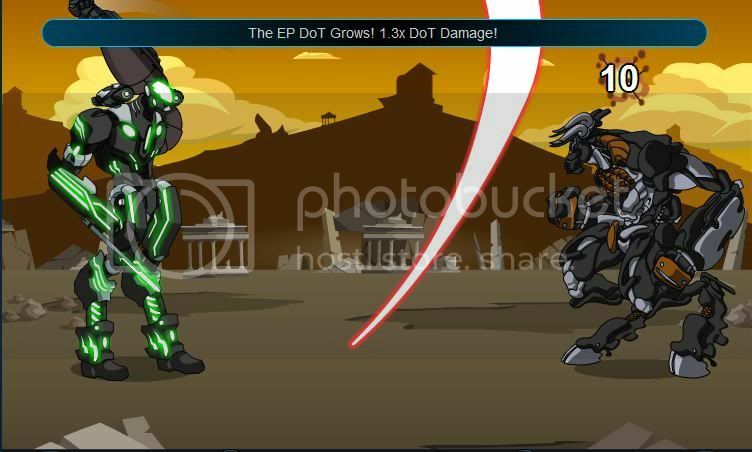 ", Inflicts either an HP or EP DoT for 3 turns, selected by clicking the weapon. If the old DOT is still active when you re-use the weapon, the new one grows by 50%, otherwise it's just a normal 1x DoT. Stays the same type of DoT for the entire battle. Description: Fires off several scorching lasers that will increase your bonus and decrease enemy defense. Can also inflict an HP or EP DoT that grows in strength if you rapidly use this weapon! BONUS: This version lets you pick which DoT to use by clicking it!